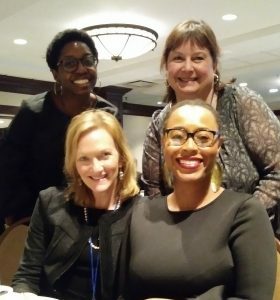 On Thursday, March 15th, the Women’s Transportation Seminar Pittsburgh Chapter hosted its second annual Scholarship Gala and Fundraiser, and honored the winner of the 2018 Molitoris Leadership Scholarship. WTS is an organization working to advance women’s careers through professional development and networking opportunities. While WTS International was established in 1977, the Pittsburgh Chapter was created in May of 2015 with help from organizers including CMU’s own T-SET University Transportation Center (UTC), Traffic21. This year’s Scholarship Gala was put together by a planning committee of WTS members; all of whom were credited during the event. The planning committee included one of CMU UTC’s Women in Intelligent Transportation Fellows, Ngani Ndimbie. Pictured clockwise from top right are Lisa Kay Schweyer, Allanté Whitmore, Karen Lightman, and Ngani Ndimbie. Also representing T-SET University Transportation Center, Traffic21 from CMU were Program Manager Lisa Kay Schweyer, Metro21 Executive Director Karen Lightman, and Diversity in Transportation Fellow Allanté Whitmore. Allanté is a Ph.D. student in the Engineering and Public Policy Department and the Department of Civil and Environmental Engineering with research interests in societal and environmental impacts of autonomous vehicles. She is studying under CMU faculty Scott Matthews, Costas Samaras, Chris Hendrickson, and Gabrielle Wong-Parodi. 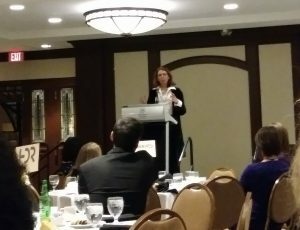 This year’s keynote speaker was Karina Ricks, Director of Department of Mobility and Infrastructure for the City of Pittsburgh. Karina has been a collaborative research partner to CMU’s own T-SET UTC faculty research, playing an integral role in ensuring that UTC research efforts could be tested and deployed in the real world. The winner of this year’s $2,500 scholarship was CMU’s Grace Taylor- an undergrad in the Department of Civil Engineering. The Molitoris Leadership Scholarship is awarded to female undergraduate students demonstrating academic strength and leadership skills, by taking risks and persevering to reach successful outcomes, in the field of transportation.